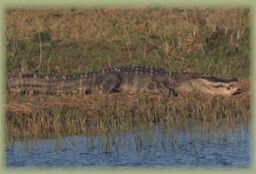 Everyone will feel in touch with Mother Nature when you glide through our trails to watch baby gators in the North Cove. Stadium seating ensures perfect views for both front and back seat passengers. Our comfortable six passenger boats glide into areas only accessible by small airboats. Experience the real "Old Florida" on our nature tour. Call and we will save a seat for you.